The Massachusetts Arborists Association (MAA), a professional trade organization serving the commercial arboriculture industry, recently held its annual meeting and election of officers. BTSE is proud to announce that our own Trumbull Barrett was elected by its membership to serve on MAA’s Board of Directors. Founded in the late 1930s, MAA advances our profession through education, research support, certification and promotion of the value of arboriculture to the public. Today MAA has the distinction of being one of the oldest arboriculture associations in the nation, boasting a membership of over 650 of the state's leading arborists. In 1957, MAA initiated a voluntary certification program and established the Massachusetts Certified Arborists (MCA) Examining Committee. The title "Massachusetts Certified Arborist", through its comprehensive examination and rigorous continuing education requirement has become the symbol of tree care professionalism throughout the industry. The MAA and MCA program are the cornerstones of the state's professional tree care industry. Through education, awareness and advocacy, its members are building stronger businesses, training more qualified arborists, and serving the consumers of Massachusetts with reliable and sustainable tree care. 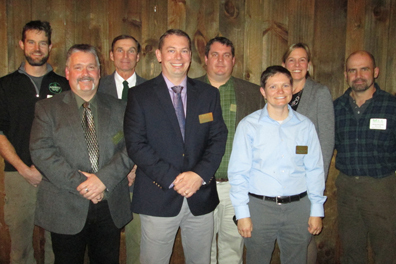 2014 MAA board of directors: (Front row,l-r) John Terault, MCA; Greg Mosman, MCA; Natascha Batchelor, MCA; (Back row, l-r) Trumbull Barrett, MCA; Richard Herfurth, MCA; Marc Hansen, MCA; Virginia Wood; Dan McCarthy, MCA.